This Is a favourite among Crystal Healers, but not a very well known gemstone. Recently I received a very excited phone call from a good friend of mine who was in Peru! ‘What are you doing in Peru?’ I asked him. I thought he must be on holiday as there is very little gem mining in the country. It turned out that one of his friends had just discovered a small deposit of gemstones and had called him in for his opinion. 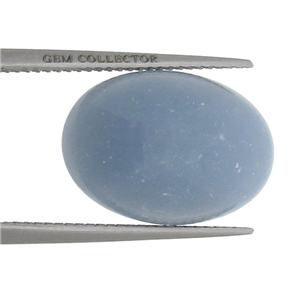 What had been discovered was a gemstone known as Angelite which is a delicious lilac, pale blue gem variety of Anhydrite (a gem formed from the compression on Celestite over a period of millions of years), so named for its angelic appearance. Anhydrite can also be found in white, grey, blue, pink and red, but only the lilac-coloured variety is known as ‘Angelite’. Despite the common occurrence of Anhyrdite, good quality specimens are extremely rare. It is also a fairly new gemstone, having only been discovered in 1987 in Peru. On the very rare occasion, you may find a piece that is green and similar in appearance to Malachite. Its hardness of 3.5 on the Mohs scale coupled with its orthorhombic crystal structure makes it ideal for carving figurines and beaded jewellery. In fact, it is believed that the Ancient Egyptians used the Anhydrite rock to carve animal figurines. It is both extremely beautiful and is reported to have many healing benefits. Some people have reported optical properties including an internal play of light, and some specimens fluorescing under UV light. Throughout this book you will have noticed that we do not talk about crystal healing too much, preferring to concentrate more on the background and technical aspects of gems. However, with Angelite it’s hard to ignore some of these beliefs as they appear quite constant regardless of whom you talk to or whichever book or website you read. Now that might be because everyone is copying each other’s research and if that is the case let me apologise for jumping on the bandwagon! Healers use Angelite to unblock energy pathways and to balance the thyroid. It is also highly regarded by crystal healers as assisting with communication with other humans, including those who are no longer with us. I have also read that Angelite is very useful for weight control and although my wife (who is very slim) has yet to wear the gem, in her previous career as a pop singer her stage name was coincidently Angelle! The gem is believed to be related to the fifth chakra (throat), which helps with communication. Angelite is said to provide the wearer with a heightened awareness and to help one focus on kindness and brotherhood. It is said to promote compassion and understanding and to alleviate psychological pain. As well as Peru, Angelite has also been found in Germany and New Mexico.